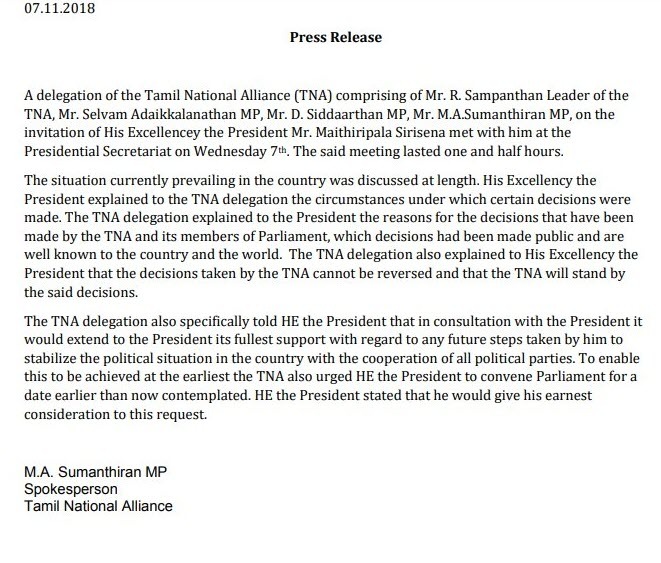 The Tamil National Alliance has informed the President that the decision of the party can not be changed due to the prevailing political crisis. The leader of the alliance, R. Sampanthan and a group of party representatives met with President Maithripala Sirisena this morning (07). Issuing a statement, the Tamil National Alliance says that the discussion held at the invitation of the President has held a lengthy discussion on the current political situation in the country. The alliance has pointed out that the best solution to resolve the crisis is to reconvene parliament as soon as possible. The TNA has further stated that the President agreed to consider the request.